Fans attend Michael Jackson's 51st birthday celebration in Prospect Park on August 29, 2009. The good news is that Spike's Lee's MJ tribute, "Brooklyn Loves Michael Jackson" is going down again this Sunday. The even better news is that Spike called it the "2nd annual" event, meaning we can mostly likely expect the Kings County tribute to the King of Pop year after year. Last years event at Prospect Park's Nethermead was a little bit of shangri-la: people danced the day away as DJ Spinna pulled together a block-rocking tribute that kept tens of thousands of New Yorkers moving and grooving. 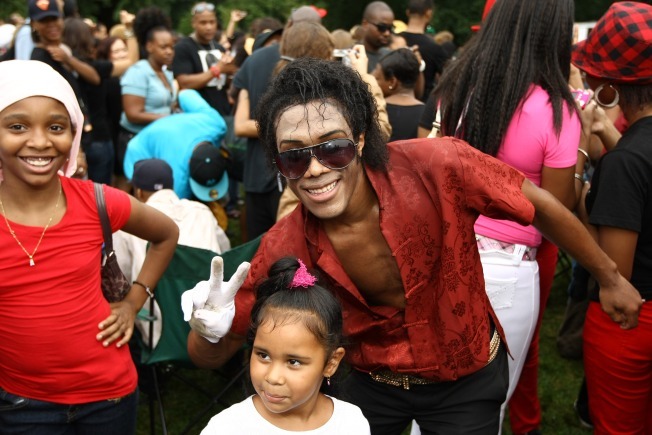 MJ impersonators were in abundance as a New Yorkers of every age and stripe came together in celebration of what would have been Michael's 51st birthday. It was a day you wouldn't want to miss and it should be off the wall again this Sunday. "Tell your friends, tell everybody," Spike said in a video announcement. "You don't have to be from Brooklyn. You don't even have to be from New York. People are going to be coming from all over the world."